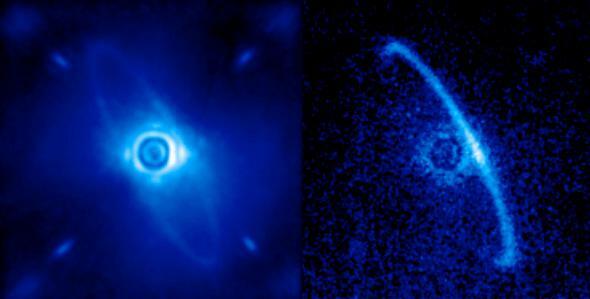 Gemini Planet Imager: New camera to photograph alien worlds. The far-distant alien planet Beta Pic b pops right out in a picture by the Gemini Planet Imager. GPI will take snapshots of dozens of exoplanets. Click to get a beta pic. Get ready to see a lot of exoplanets images pretty soon: The Gemini Planet Imager is online and ready to seek out strange new worlds. GPI is a camera that is used on the Gemini South telescope, an 8.1-meter behemoth located in Chile. 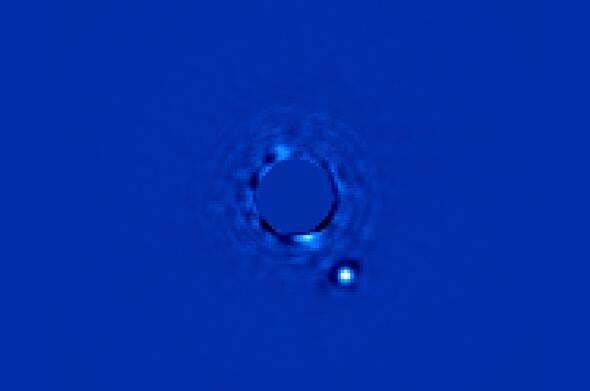 GPI is the size of a small car and uses advanced optical techniques to provide incredibly crisp images of young planets orbiting distant suns. It will be able to clearly see exoplanets even when they are 10 million times fainter than their parent stars, and separated by as little as 0.2 arcseconds: Roughly the apparent size of a quarter 25 kilometers (16 miles) away! The camera is designed to look in the infrared; young planets (less than a billion years old) are still hot from their formation and glow brightly in infrared while stars tend to be dimmer in that light. The first test runs were carried out in November 2013 and went very smoothly. When I saw the images, I literally gasped. GPI is a game-changer. The image above, for example, shows the planet Beta Pictoris b, about 63 light years from Earth (the star itself was masked to reduce its light, and the planet is easy to spot.). The planet orbits its parent star in an ellipse that ranges from about 1 billion to 2 billion kilometers; roughly the same distance Saturn and Uranus are from the Sun, respectively. It’s been seen before, but previous observations have taken long exposures to get good data. GPI can get pictures like that of Beta Pic b in mere minutes. Amazing. That’s a planet, orbiting a star over 600 trillion kilometers away! And now, getting a picture of it is easy. GPI can look at worlds in our solar system, too, like Jupiter’s moon Europa (right). Compare that to the map of the moon made by space probes that actually went there (left)! Click to enarthurcclarkenate. Multiple observations made over time will directly reveal the motions of planets as they orbit their stars, allowing astronomers to determine the shapes of the orbits. Not only that, but GPI can take a spectrum of the planet; it can break the incoming light up into separate colors, which astronomers can then analyze to obtain a treasure trove of info about the planet, including its atmospheric composition, temperature, and more. A thin ring of dust circles the star HR4796A, debris left over from the formation of the system. Click to embiggen. HR4796A is a young star and is surrounded by a thin dust ring. On the left it shows the star and ring in normal light, and on the right is the image looking at just the polarized light. The light coming from the star itself isn’t polarized, so it disappears, leaving just the dusty ring visible. This is in fact the best image of the ring I’ve ever seen (and I worked on Hubble images of this ring a few years back). The ring completely circles the star, but due to the geometry we see more polarized light coming from the back of the ring (to the right) than the front, so the back side looks brighter. The ring is so narrow that it may be sculpted by the gravity of an unseen planet or planets; it’s hard to say. Images like this will go a long way toward figuring that out. And there are a lot of stars with dusty debris around them we can target with GPI. I am very, very impressed with this machine. Over the next few years astronomers will embark on a survey to look at a stunning 600 young stars to look for planets around them; they expect to find dozens. Mind you, right now we only have about a dozen exoplanets total we’ve directly photographed (the vast majority are found indirectly, by their effect on their stars). GPI will blow that number out of the water. I’ve been saying for some time that with the recent advances in tech we’d be getting lots of exoplanets images soon. Sometimes I love being right. I can’t wait to see what the next few years will show us. Correction, Jan. 9, 2014 at 16:30 UTC: I had mistakenly swapped the front and back of the ring in the original version of this description, based on a) an embargoed version of the original press release, which was later revised, and 2) my own knowledge of these rings; another ring I read about had the front side more polarized than the back. This can depend on a lot of different factors, and may be different in different objects. My thanks to Randall Munroe for pointing this out to me!